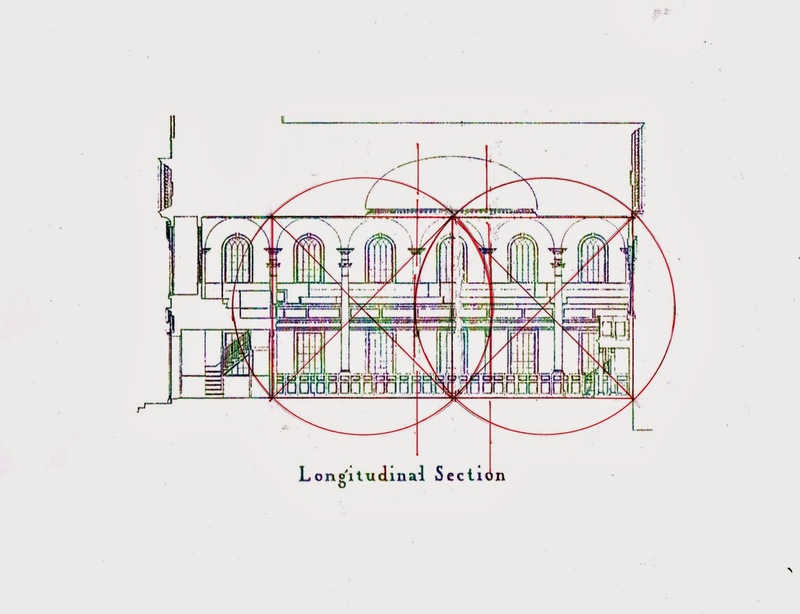 The first post on the Old First Church geometry using the daisy wheel, showed how the geometry of the daisy wheel was used to layout the interior view facing east (north/south cross section) of the church. The daisy wheel was also used to layout the longitudinal (east/west section) shown here. (The red circle with its 6 petals is the 'daisy wheel'." Just as in the first section the top of the circle is the roof of the church. The left and right sides of the circle mark the ends of the sanctuary. The part of the church to the left is the 'porch' or narthex and also the base for the tower. The balcony on the second floor extends into the tower frame. It is to the left in the photograph. The left hand column is the column at the left side of the daisy wheel above. The height of the sanctuary - not including the dome - is set by the 4 side petals of the daisy wheel. The bottom of the circle may have originally been the floor of the basement. The foundation and piers for the columns have been repaired and rebuilt, so it is not possible to be sure where the base of the church really was when the construction began. The square (4 sides) and its circle - not the daisy wheel (6 sides in its circle) - determine the wall proportions. The elevation divides neatly into 2 squares. 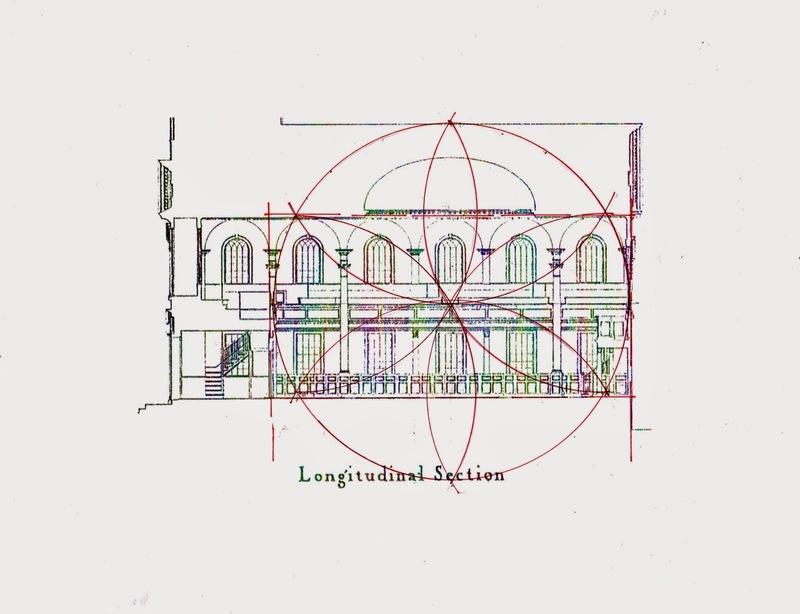 The circles which surround the squares and are generated from a radius made up of half the square's diagonal cross at those centered windows, creating a 'vesica piscis'. On outside of each circle, also the edges of the vesica piscis are the columns. That spacing is the interval for the columns. 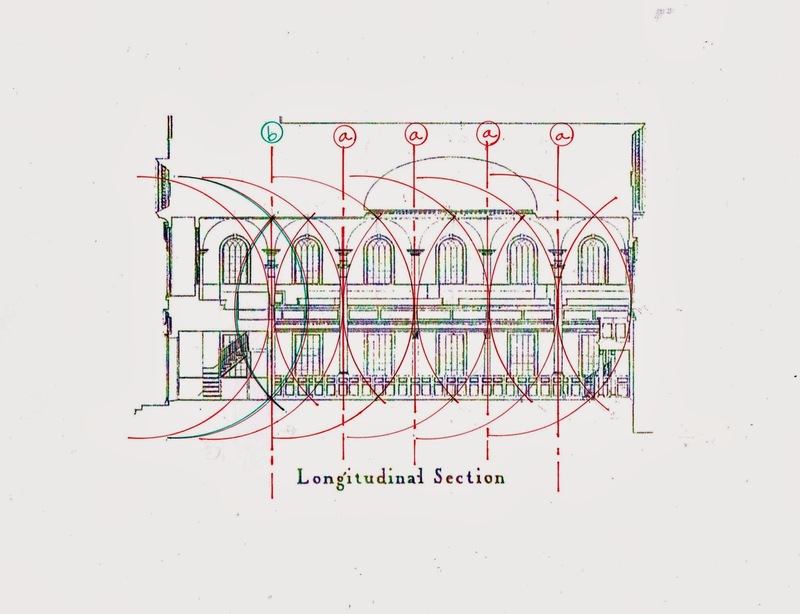 It is like the circles that determine the glass pattern in the arched tops of the windows, a pattern that can run either way, or that comes from each side and meets here. I think a carpenter would have used his dividers to transfer the column and windows spacing instead of drawing all the intersecting circles. To make the pattern clear I show here all the vesicas and part of the circles. I find it complex to read. It wasn't easy to draw. On the left end I have laid out in green the vesica centered on the column instead of surrounding the window, just to show that the pattern can start with either the window placement or the column placement. Finally when the 2 squares and their circles are moved so that the edge of the right circle defines the location of the east wall of the sanctuary, the edge of the left circle defines the west wall. Here I have outlined the sanctuary space in black - showing how the balcony extends over the narthex, but not quite to the front of the tower. The squares and their circles in my first diagram above are simply moved over. I have written 7 posts on the Old First Church. Except for the post on the VAS, they are all about the geometry used to design the church.